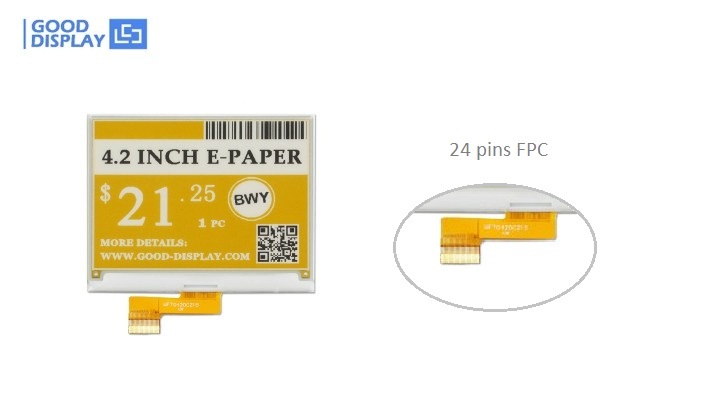 Requirement of low power unique display device is getting higher in market, different types of displays are tailored for tarketed applications, 4.2″ BWY three colors E ink E paper display from Dalian Good Display joins in this race. This is a E ink E paper display device with 4.2 inch size and has 400 x 300 resolution. This display cames in square shape. It provides 24 pins FPC connection and optional FPC connector, this display can communicate with embedded controllers through SPI Interface technique. Gives display in Yellow, Black and White (three) colors. This display termed as GDEW042C37 by good display, it has many advanteges they are, Ultra low power consumption, near 180 degree view angle, it gives better visibility under sunlight and also utilize low current in deep sleep mode. This display Keep displaying the last content when power down. Ultra low power consumption, basically power is only required for refreshing or change the display image. Most suitable SPI interface communication for microcontrollers and embedded controllers, Available in COG package IC thickness 300um. This display is a TFT active matrix electrophoretic display with 4.2 inch active area and has 1-bit white/black and 1-bit yellow full display capabilities. This display GDEW042C37 can be used in IoT (Internet of Things) products, shelf label, smart tags, industrial instrument, smart cards and other related products.